Instant pot coconut-poached mahi-mahi recipe. Mahi-mahi fillets with spices cooked in a pressure cooker. If mahi-mahi is not available, use any of white-flesh fish as a substitute, such as bass, halibut, cod, snapper, etc. Mahi-mahi is the Hawaiian name for the types Coryphaena hippurus, also known in Spanish as the Dorado fish. This fish has white flesh and good enough to include in a diet that is lower in calories and fat intake. Mahi-mahi is a reach of protein, potassium, selenium, and vitamin B12. 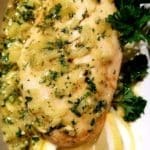 How To Cook Coconut-Poached Mahi-Mahi in an Instant Pot? 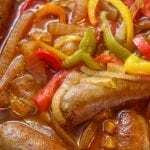 Use a 5-7 quart (5-7 L) pressure cooker for this fish recipe. The plain (not toasted) sesame oil is an excellent choice for high temp cooking, therefore, you can also use regular olive oil. 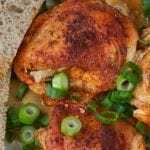 I used Asian fish sauce in this recipe. It’s made out of a mixture of fermented fish and salt and has the same acrid fishy smell as cured anchovies. In case this fish sauce is not available, use a dark soy sauce as the substitute. Heat the oil in 5-7-quart (5-7 L) pressure cooker over medium-high heat. Add minced shallots and cook, stirring occasionally, until soft, for about 2 minutes. Stir in the ginger, cilantro, llemongrass, fish sauce, and coconut milk. Reduce heat to low and bring the mixture to a simmer. Using a spatula, lower the mahi-mahi fillets into the hot liquid. Close the pot and lock the lid. Set the burner heat to high. When the cooker reach high pressure, reduce heat to low. Set the timer to cook for 3 minutes. Remove the pot formthe heat. Using the natural Release method, open the cooker and allow to stand for 5 minuts, to bring the pressure to normal. Using the spatula, remove cooked mahi-mahi fillets from the pressure cooker. Transfer to a serving platter. Discard the lemongrass and cilatro stems. 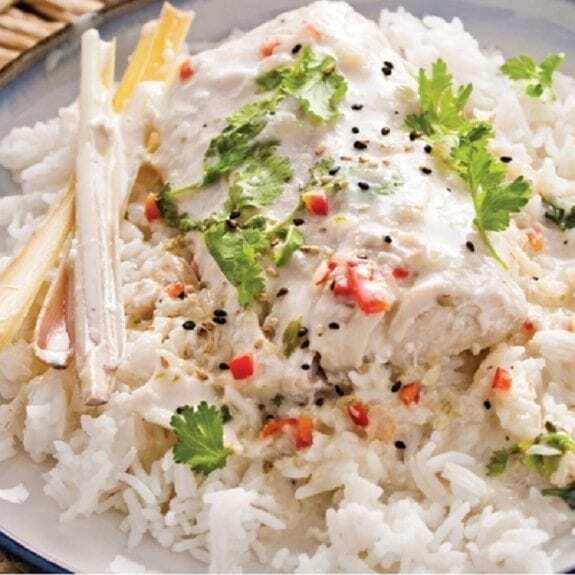 Spoon the coconut sauce over the cooked fish. Season to taste with black pepper. Serve over cooked rice. Sprinkle with sliced green onions and garnish with lime wedges if desired.